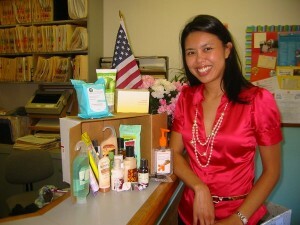 As her project in Landmark Education's Self-Expression and Leadership Program, Cindy Chan formed Operation Courage is Beautiful, an organization dedicated to acknowledging women in the U.S. armed forces stationed in Iraq and Afghanistan by sending them care packages of health and beauty products. Chan created a partnership between her own company, Stylesynch, and the Veterans of Foreign Wars post 3787 and the San Diego Armed Services YMCA. Chan has surpassed her initial goal, which was to create and deliver 1,000 care packages consisting of a wide array of products including skin care items, soaps, manicure items and women's magazines. Begun last fall, Chan is continuing to expand the project, with a gala event held on May 20, 'Comedy and the City', at the Jasmine Seafood Restaurant in San Diego. Chan says she got the idea from a fashion magazine where she was struck by how much it would mean for these soliders to be able to be able to be in touch with their feminine side. Said one woman soldier interviewed on Chan's website, "These products alleviate some of the issues we may have and ultimately help us feel good about ourselves as well as maintain some sort of normalcy level." Operation Courage is Beautiful has been recognized by a wide variety of media outlets, including NBC in San Diego. The organization also received a special certificate of recognition from congressman Bob Filner. To read more coverage about Operation Courage is Beautiful or to contribute to the ongoing campaign, visit Operation Courage is Beautiful online. A landmark graduate has created an app to express gratitude. In Landmark ‘s Self-Expression and Leadership Program, Amit Rana created a booming South Asian Film festival that is entering its fourth year. In Landmark Education’s Self-Expression and Leadership Program, Mark Lombard created a way to connect the ill and immobile with great art – read more about this unique and moving project. Michael Johnson created a program wherein he and his son and his friends would give burritos and other items to the homeless in San Diego, and through taking the Landmark Self-Expression and Leadership Program, he grew the project and made it a model for other like projects around the world.